Just like drinkers celebrating the impending end of dry January, these adorable fawns have been filmed guzzling milk like there's no tomorrow. 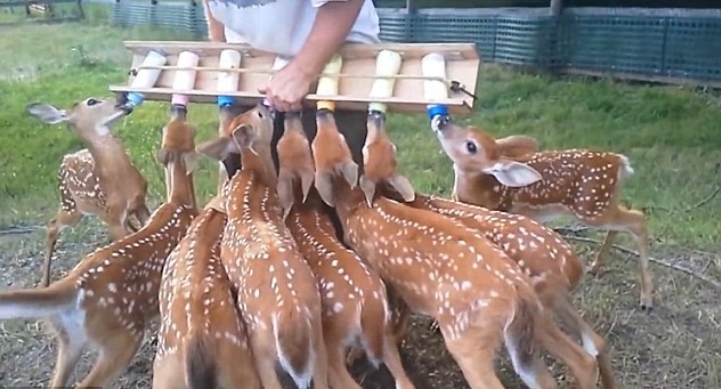 As a volunteer at a wildlife sanctuary arrives with bottles of milk, the eight young deer practically pounce on the teets and begin drinking furiously. One fawn, who drinks from a bottle held the man, has to be helped to manoeuvre his legs so he can reach the milk. Founded in 2011, Nora's Ark responds to the rehabilitation needs of those animals that are sick, injured, or orphaned and release healthy wildlife back into their natural habitat. Later in life, these fawns will feed primarily on leaves. Deers tend to eat eat easily digestible shoots, young leaves, fresh grasses, soft twigs, fruit, fungi, and lichens. Responses to "Herd of fawns rush to drink from bottles of milk at Wildlife sanctuary"